When Sidney Stratton develops a fabric that never gets dirty and never wears out, manufacturers and trades unions are terrified by the threat it poses to their industry and their jobs. Only Daphne the mill owner's daughter, shows Stratton any sympathy as his world gradually falls apart before he finally finds love and a new idea. Based on the 1951 Ealing Comedy which starred Alec Guinness, Joan Greenwood and Cecil Parker and was directed by Alexander Mackendrick - nominated for an Academy Award for Best Writing (Screenplay). Based on the play "The Flower Within the Bud" by Roger MacDougall and Screenplay by Roger MacDougall, John Dighton and Alexander Mackendrick. World Premiere. The Man in the White Suit website. Performers Stephen Mangan (Sidney Stratton), Kara Tointon (Daphne Binley). Adapted by Sean Foley. Sound Michael Taylor. Design Michael Taylor. Director Sean Foley. Between 5th September 2019 and 11th January 2020 this tour will visit 2 venues in Bath and West End. Current and future dates only. You can embed this tour information on your own website by adding a single line of code to a page and using the Qtix code T1465002926 - for details see our Embed Information page. 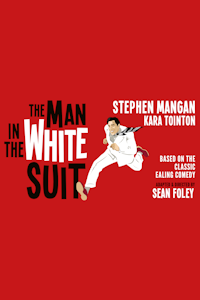 Receive email notifications of changes to The Man in the White Suit.